Long before DeadpooI was forcing audiences to re-think who comic book movies can be for, Alex Proyas brought us the neo-noir, R-rated adaptation of James O’Barr’s graphic novel, The Crow. 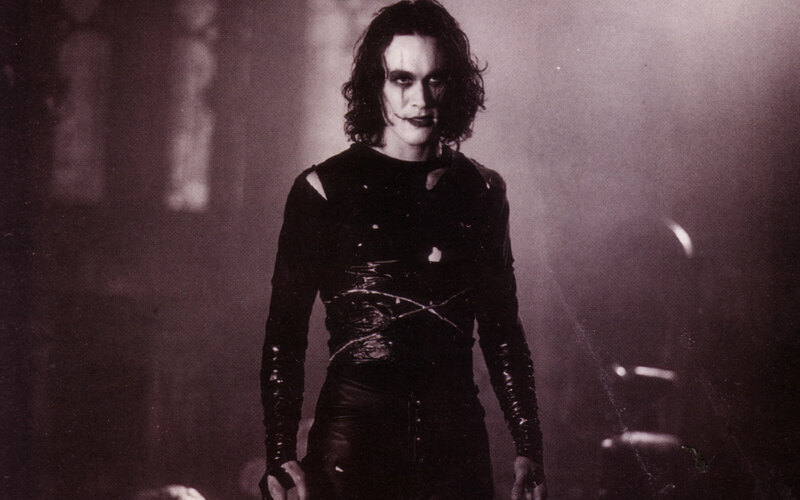 Eric Draven’s tragic tale of death and rebirth cannot be separated from the real-life tragedy that accompanied the making of the film; the death of star Brandon Lee. Son of martial arts legend Bruce Lee, Brandon was accidently killed on set by a defective fake gun. Like with Heath Ledger, who would never get to see the incredible work he’d done in a graphic novel adaptation, Lee’s performance is spellbinding and layered with a thick, palpable “what if” feeling. The fact that the subject matter of the film explicitly deals with death, loss, moving on, and not taking the little things in life for granted just furthers the poignancy of every scene in which Lee’s Draven appears. “Nothing is trivial” says both Draven and Lee from beyond the grave. His expressive face and unique look and voice hint at an actor who could have been one of the biggest stars in the world but The Crow is all we will ever get, and should be cherished all the more for it. Faithfully adapted from the comic book in terms of look and feel, the movie actually toned down the violence and difficult adult subject matter. Apparently not enough at the time, as critics in 1994 didn’t know what to do with a hero with superpowers who kills people with heroine needles. Still, The Crow built in a huge cult following of people who didn’t care who the movie was “supposed to be for” and instead were able to find the heart in a film covered in so much death and gore. The plot is relatively simple. Good guy and his girlfriend get killed by bad guys. Good guy comes back for revenge. It’s all the moments in between that make this movie so re-watchable. When Draven absorbs the memories of the police officer who stayed by his side in death or when we uses his music to connect to an old friend and remind her “it can’t rain all the time” the movie stops being about its own plot and becomes a reminder to us all to hold onto the things and people that we love, because we never know when they will be gone. In the future, people will try to claim that Deadpool proved the value of adult-oriented comic book films but really the formula was shown over 20 years earlier. Marvel and DC are only recently starting to get this, but nailing the inherent themes of the characters and stories rather than trying to change them so the uninitiated will “get it” is the route to the superior film. The Crow is still every bit as mesmerizing and powerful today as it was when it was released. Maybe now in a world where we can finally take these things “seriously,” The Crow will get its due recognition for being roughly 20 years ahead of its time.